Maybe it's about his ankle treatment, too. Maybe he still has a special therapy to follow, that's why he couldn't stay longer. I totally agree with you, Roger Federer is the GOAT in tennis IMHO! You must have that special something that makes you attract audience, excellence in your sport aside! Yuzu has it, Yuna Kim had it, Roger has it and there aren't too many out there like them. Complete package, indeed! 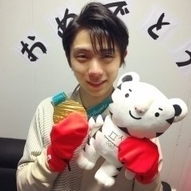 Nothing about FaoI yet ... Do you, guys, remember when Yuzu made the announcement that he's doing FaoI last year? Satomi Ito talking abt Yuzu's costumes!